Starting on April 18, players can jump into a new, limited-time mode, unlock special Appearances via Crystals and/or Credits and more in the Star Wars Battlefront II Night on Endor update. Whether you begin as an Ewok defending your homeland and stalking your Imperial enemy, or as a stormtrooper fighting to escape the ambush, players can fight through the night for control of Endor in the all-new Ewok Hunt mode. In Ewok Hunt, you start as an Ewok or in a group of stormtroopers. The ambush begins as Ewoks attack unsuspecting stormtroopers, using spears, Wisties, and other skills to take down their opponents. 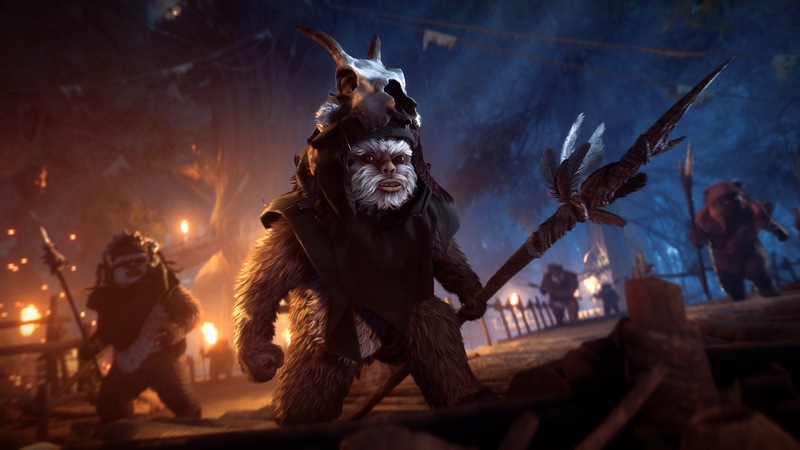 Each stormtrooper defeated spawns as another Ewok, multiplying until the Empire’s forces have been completely eliminated, and the Ewok celebration can begin. However, the stormtroopers’ superior training and firepower are more than a match for the Ewoks. Armed with a cadre of weapons as well as flashlights to pierce the darkness, players must hold back the Ewok’s ambush if they have a hope of surviving until an extraction team can arrive. Also as part of this month’s release, Crystals will return to Star Wars Battlefront II as one of the ways for fans to unlock Appearances, including Endor Leia and Endor Han. Real-world currency can only be used to purchase Crystals, which are only redeemable for Appearances (learn more about Crystals in our FAQ). Credits are earned through in-game activity and can be redeemed for Appearances, as well. Over 50 additional Appearances to personalize your units will be made available in this update. (learn more about Appearances and rarities, and get even more details on this update, in our Community Transmission).